I have written about this experience of mine previously in my native Portuguese, English and Italian on various internet sites and bulletin boards, but this is the first time I have ever formalized my thoughts into an actual article for publication. 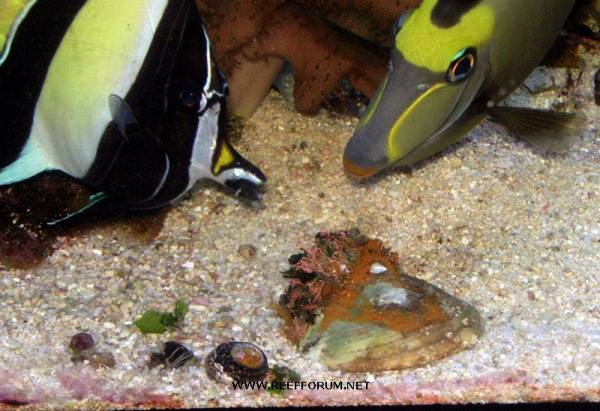 Though this is primarily a report of one aquarist’s experiences successfully keeping Zanclus by feeding them natural live sponge, a food which represents some 85 to 87% of their natural diet (Garilao et al, 2008 – fishbase.org), I wanted to extend the scope of this article a bit further to consider the needs of other fish species that are also primarily sponge eaters. One thing that has always left me thinking was reading about various species whose natural diet was composed of sponges. Despite the heavy losses, little or no efforts were being made by either the industry or hobbyists to provide such kinds of food to animals that are frequently imported. 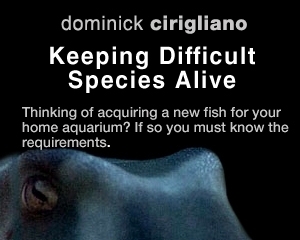 Many species still are clearly described as sponge eaters and for that reason many of those are very difficult to keep. So, profiting from my experience with feeding Zanclus with live sponge, I extended it to other species like Pygoplites diacanthus (Regal Angel), Pomacanthus “Euxiphipops” xanthometapon (Blue Face Angel), Apolemichtys trimaculatus (Flagfin angel), andHolacanthus tricolor (Rock Beauty), as well as many others. These are mostly species with low survival rates largely attributed to inadequate food and/or difficulty to adapt to prepared foods. 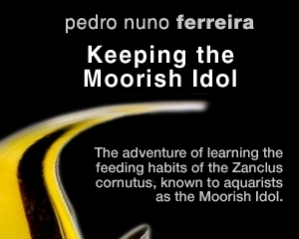 The Beginning The adventure of learning about the habits and needs of this marine jewel known to both science and the marine aquarium hobbyist as Zanclus cornutus (Moorish Idol) started in August, 2006. I had just returned from a short holiday and decided to visit a LFS owned by a friend of mine. I arrived at the shop in the middle of a very hot summer afternoon and there they were two small Zanclus peacefully swimming in the lower tank. Well, knowing from experience how difficult these fish were to keep, I decided not to purchase either of the Zanclus and to wait some more time just to see how they behaved and adapted. Some two weeks later, I had to travel again. The evening before, I once more visited the LFS and bought one of the Zanclus. 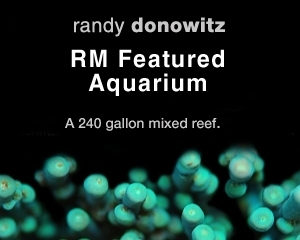 I went home and placed it in the tank only lit by the artificial moon light. 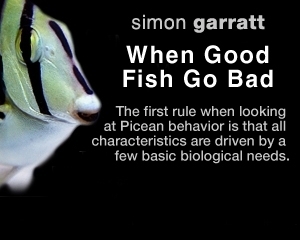 This is an approach I always use to introduce new fish, so that they see and are seen, but under a calm ambiance. That helps considerably with the acceptance of the newcomers by the already resident population. There is almost no bickering in the majority of cases. When I introduced theZanclus, it almost immediately selected its spot at a central part of the rock-work almost under the beam of moon light. From there, it could control its surroundings. This has remained its spot ever since then. The resident population came to see who it was, but I witnessed no aggression. After 24 hours, I was happy to find everything still in good condition. The following day started what was one of the most difficult parts in the acclimation process: getting the Zanclus to feed. This difficulty is lessened if the handling and transport are good. 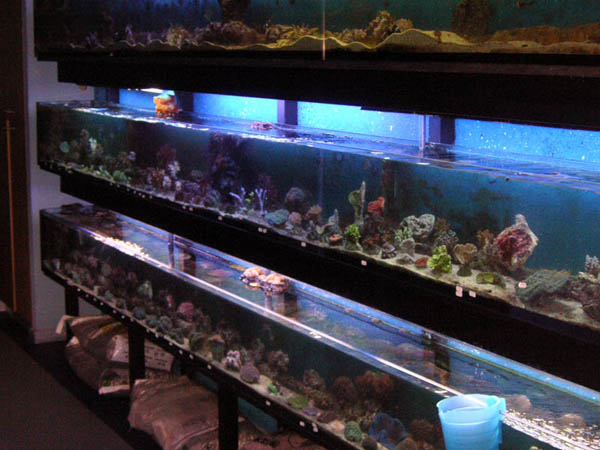 The collection and handling prior to delivery to the customer is an issue often neglected that has severe consequences for Zanclus as they seem to suffer quite significantly with poor handling, even moreso than many other delicate fish. 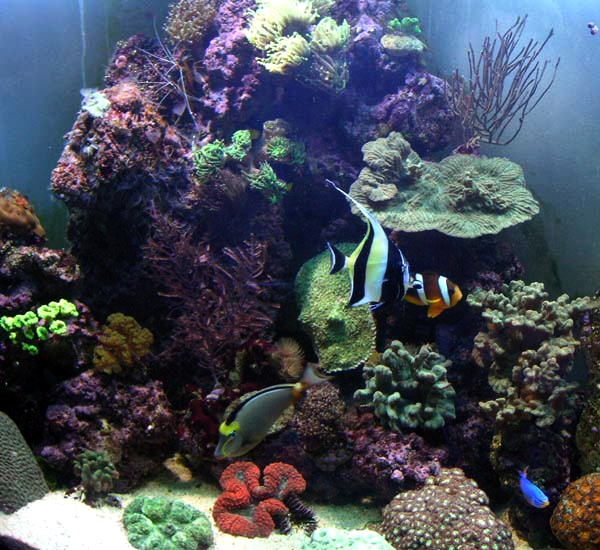 I started by feeding my Zanclus Ocean Nutrition red algae that I moistened and macerated between my fingers. This was an operation done twice a day. 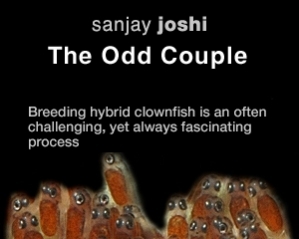 The Zanclusstarted to eat timidly, and any bit it would eat was a joy to me. As the days went on, the Zanclus kept on eating better and better. It showed further confidence, mingling with the others and associating my presence with “food time”. This went on for some days, but I knew things would have to evolve in order to provide an adequate variety of food to the Zanclus. I knew it fed on sponge and I knew that two species of sponge lived in our coastal Portuguese waters and intertidal zone. I decided to find and collect the local sponge. This idea was further boosted by information I got about an American that was feeding live sponge to his Zanclus, a live sponge collected at the floating piers off Long Island, New York! The person was none other than Manhattan Reef’s own Paul Baldassano with whom I exchanged information. I knew that I needed to find live sponge and give it to the Zanclus or it might not thrive, so one day I went to look for the sponge after returning from work. I knew what it looked like, but had little experience finding it. I looked around and finally I found some in a difficult to reach crevice. Later, with experience, it became easy to collect and nowadays 15 to 30 minutes is all it takes to find enough for two weeks or a month’s worth of food for 3 or 4 fishes. Luckily, this can be done all year round. A detailed view of the sponge that I identified as Hymeniacidon sanguine (but could be Halichondria paniceia), the bread comb sponge. So, now I had the sponge, but I knew that sponges can be poisonous, so I had to be very cautious as I proceeded. I offered a very small piece of sponge to the Zanclus and watched. The fish approached it and nipped it, but did not eat. I learned with experience that this is basically due to the dentition of the Zanclus which is shaped to rip little bits of sponge that should be firmly attached to ease the task. Well with such a first result, I decided immediately upon another approach that would make it easier for the Zanclus to accept and ingest the sponge and should at the same time reduce the risk of it fouling the tank water. By using little amounts of sponge mixed with other foods, I created a food with a consistency that would prevent the mix from dispersing in the water column, was of minimal risk of pollution, and it was easy to remove if it was not eaten. In designing my sponge recipe, I decided that the binding element should be wheat flour without yeast, and that the mix should be a very odorous and tasteful paste of minced foods that concealed minced sponge in it and had the consistency of the natural live sponge I was collecting locally. The first recipe was as follows, but you can be imaginative and vary from one preparation to the next as long as the fish likes it. 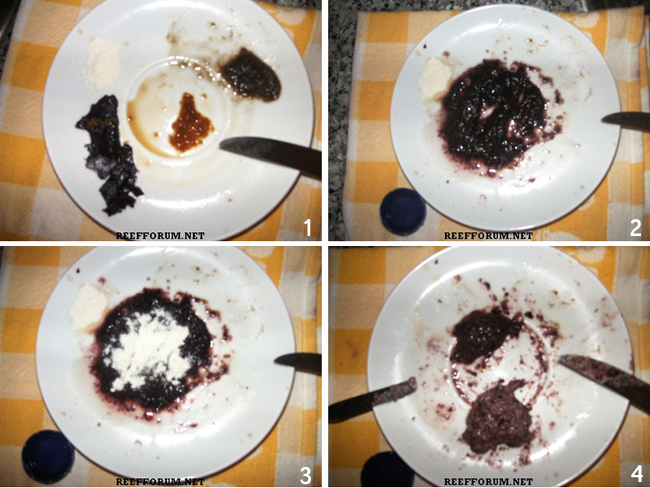 Photos correspond with steps 1 through 4 of the sponge paste preparation, moving left to right. Mince the Mysis, the sponge and the moistened algae. Add one spoon measure of Immunvit and Cyclopeeze and mix them with the previous ingredients. Now that you have a uniform paste, start adding the flour. Continue to mix it as you add it until the desired consistency is obtained. The paste should be soft and should adhere to the spoon. The characteristics of the paste being both soft and adhesive is very important because the Zanclus needs soft food to better ingest it and the adherence to the spoon ensures that in fact the food is anchored and the fish ingests the majority of it. It was a success. The Zanclus that had already gained confidence fought for the food with the others “mano a mano” and associated my presence with food. It ate the paste very well. 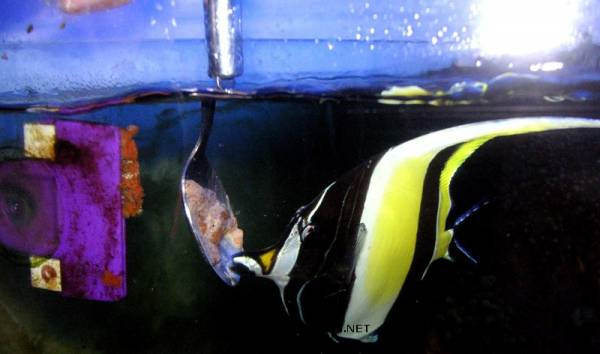 In fact, not only the Zanclus, but all the other fish that dared to approach the spoon also ate it, which caused some concern as I didn’t know if it could harm them since it contained sponge. 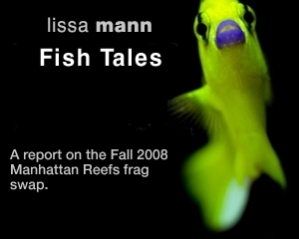 Fortunately, it didn’t and some of those fish still live with me today. Video 1Video 2 I continued to test various ways to improve upon the preparation of the paste. As a way to ease the task of feeding I came up with what I call “sponge cakes” that can be attached to a live rock or glass or the spoon itself. I also made what I call a “specific” paste. My aim was to get as close as possible to the sponge as it is. This paste I made with a lot more sponge, Cylop-eeze and wheat flour. It was also eagerly accepted. 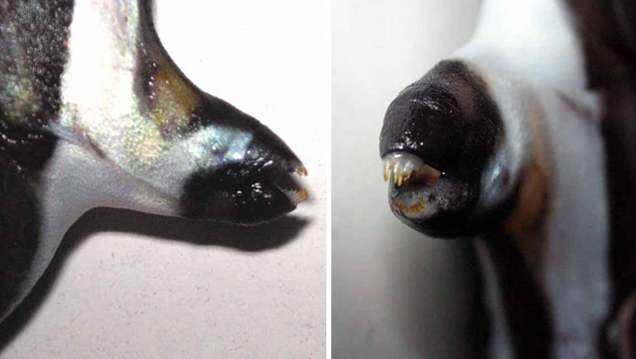 Interestingly, the other fish ate this with gusto too and often threatened to out-duel the Zanclus for its share. Here we can see the paste ready to be placed inside the refrigerator on the top shelf. Covering is very important as it will both preserve flavor and avoid dehydration. A little over a month had gone by, and I decided it was time to try once more to offer the sponge in its natural condition, both to see if in fact it was accepted, and also to ease even further the laborious task of feeding. 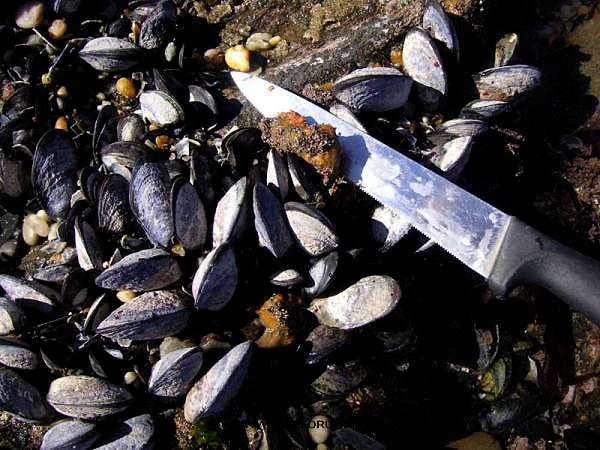 I proceeded cautiously, and I offered small bits of it, partially cleaned from sand, debris, and with some coralline algae still attached. It was well accepted. Natural sponge ready to be offered (Halichondria panicea or Hymeniacidon sanguinea). From this time onwards I mostly fed sponge in its natural condition. I even found out that it can grow in the tank if given protection from the animals that eat it. I also stopped cleaning the sponge for the most part because Zanclus, as well as other sponge eating fish, do not have me cleaning their sponge out in the sea so it is natural for them to get it as it is. This practice led to an interesting observation. 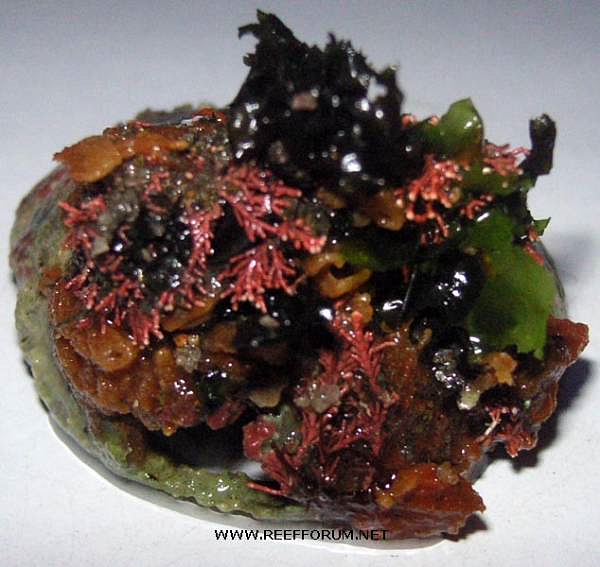 One day while collecting sponge, I found this shell stuck in the rocks covered with sponge and algae. I immediately thought of a possibility to use it for observing the reaction of the Zanclus and other fish before an item of food similar to what they would find in nature. The result was awesome. The shell covered with the sponge and algae as found. Ways to Present the Paste and the Sponge Below are some photographs showing ways to present the paste and natural sponge. Once the Zanclus gets used to one’s presence and also the presence of the spoon and learns to feed from it, we can also use that to help it lose fear of the clip holding the sponge. 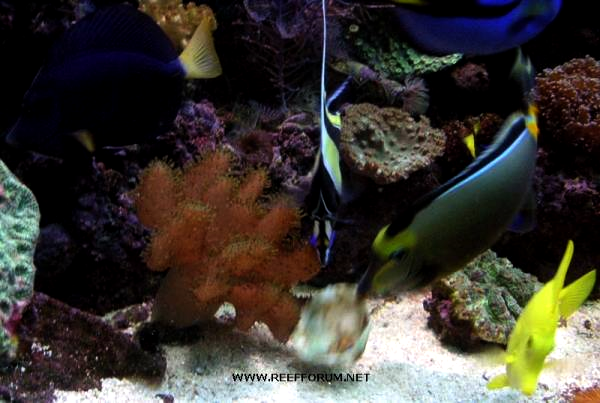 How to present larger pieces of natural sponge when the Zanclus grows and eats more. Eating Other Foods Once adapted, Zanclus do eat a lot of food and some variety will help to provide more balanced nutrition. Paul Baldassano told me he was feeding banana to his Zanclus, so I had a go and tried it out. 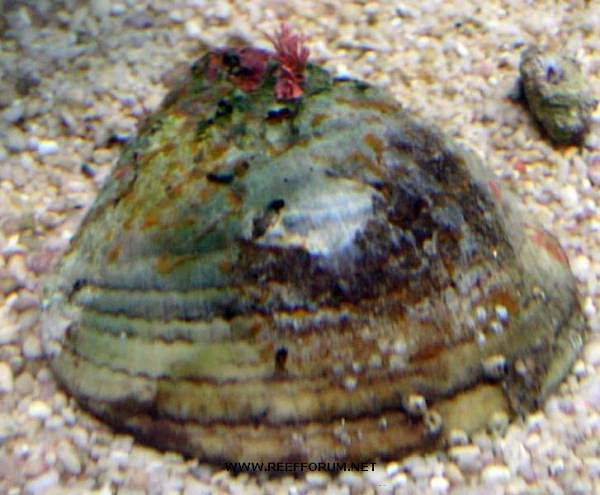 In fact, the Zanclus as well as several other fish do eat it. 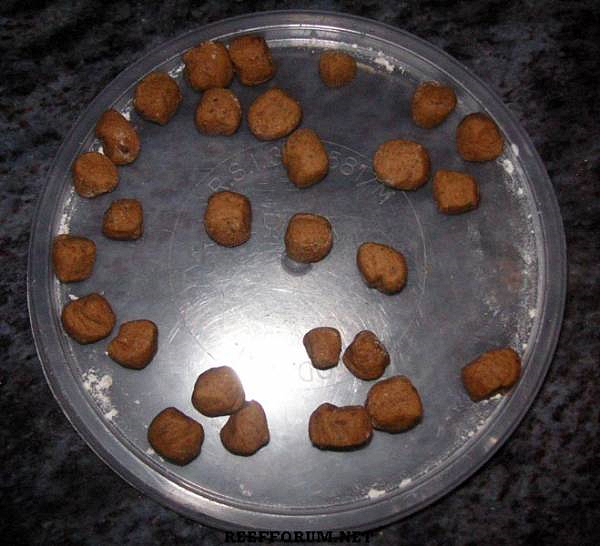 Since it is soft it can be used to conceal/attach other foods like pellets previously soaked with vitamins or a medicine to get the fish to eat something that they might not otherwise. 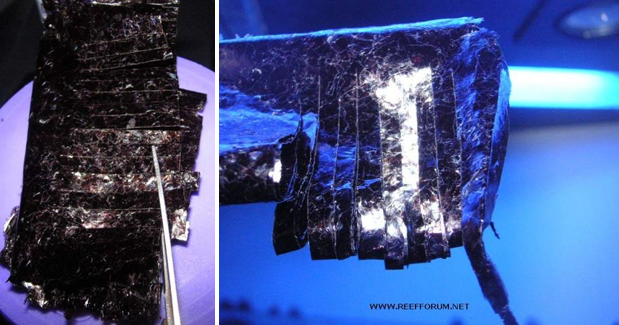 Freeze-dried algae may be presented in several ways. At first I moistened and macerated them between my fingers so that the Zanclus could ingest them more easily as it has a narrow snout, but as time went by I noticed it would seek and eat the algae flakes I offered the other fish, so here is how it is done. This method allows the production of flakes of different sizes in the same operation and the flakes are also a better way to feed algae as they float and not as much is wasted. 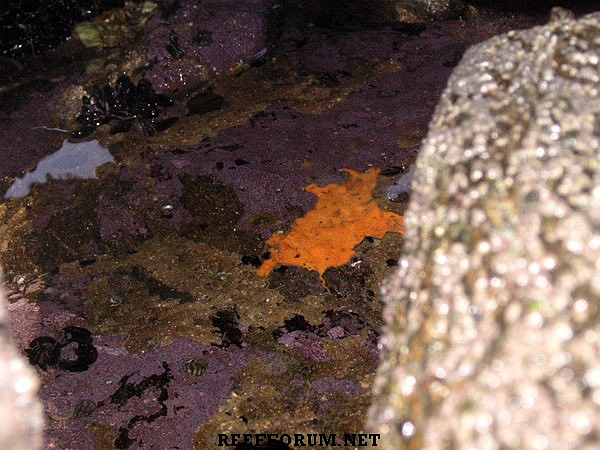 Mysis shrimp from my handVideo 3How Does the Sponge Occur in Nature The sponges I collect in Portugal are Halichondria paniceia – Bread crumb sponge – and Hymeniacidon sanguinea which are present in the intertidal zone of rocky beaches. 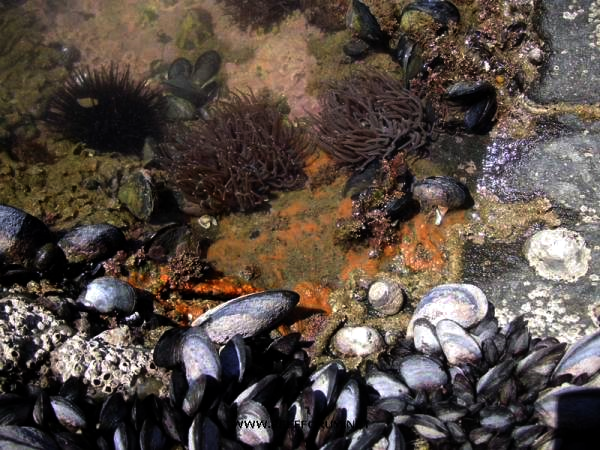 So during the low tide they may be out of the water or in tide pools or in very shallow water as shown in the photographs below. How it Occurs in New York City Water, USA Thanks to Kathy C. from manhattanreefs.com, below are some photos of the occurrences of sponges on the floating piers. At least two different species of sponge occur, the red beard sponge and the Bread crumb sponge. The Bread Crumb sponge is possibly edible. WARNING– PLEASE UNDERSTAND THAT I HAVE DONE NO EXPERIMENTS WITH THE SPONGE EXISTING IN NEW YORK WATERS AND THUS THERE IS NO GUARANTEE THAT IT CAN BE USED AT ALL OR THAT IT IS NOT POISONOUS. 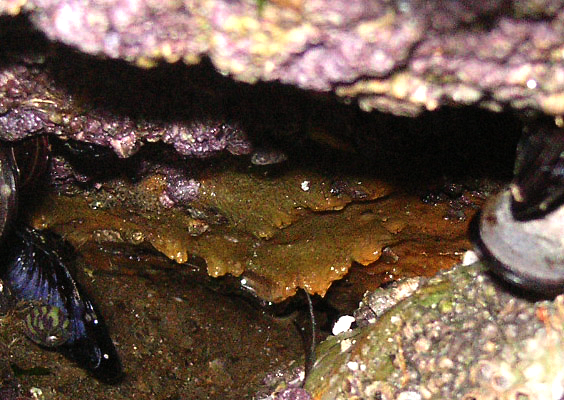 ANY ATTEMPT TO USE IT UNTIL MORE INFORMATION ABOUT IT IS AVAILABLE MUST BE DONE AT YOUR OWN RISK, SO PLEASE PROCEED VERY CAUTIOUSLY.Halichondria panicea is present in many parts of the planet and has many phenotypes (Avril, 2008). 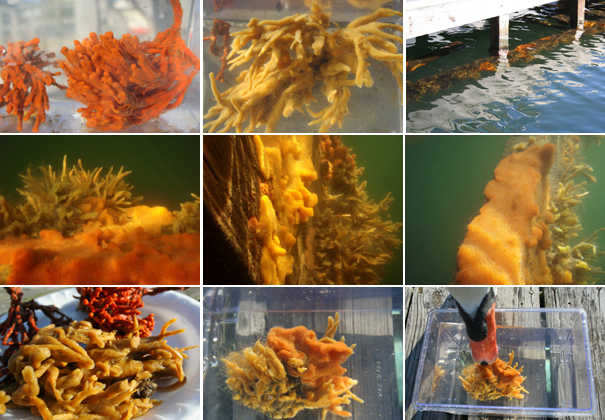 Paul Baldassano has used one type of sponge that he used to collect on the floating piers of Long Island successfully to feed his Zanclus. 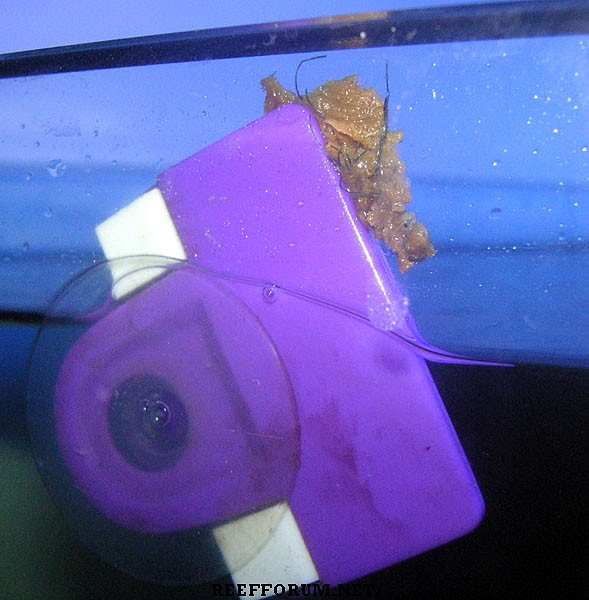 According to information provided by Paul Baldassano, this was the sponge that his Zanclus ate, and it was collected on the floating piers off Long Island. Photograph by Paul Baldassano – New Hyde Park, New York. 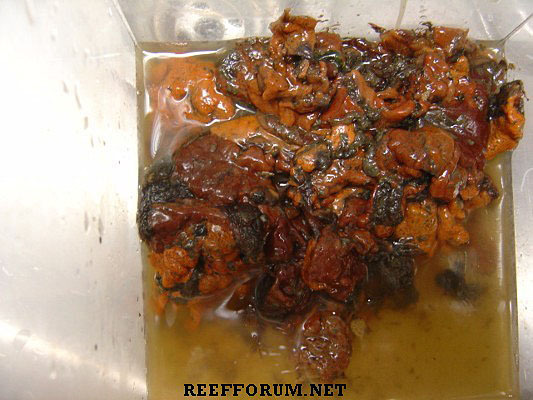 Red Beard Sponge and Breadcrumb Sponge as they occur in New York waters. Photographs by Kathy C. – Barnum Island – New York City. All photos by Pedro Nuno Ferreira, unless otherwise noted.